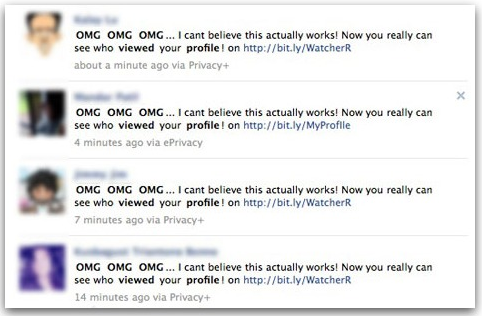 No, you can't see who viewed you on Facebook !! Let's put this matter to rest right now: Any Facebook application that offers to reveal who is viewing your profile is a scam. Period. Security research firm Sophos posted a memo about a rogue app that was spread on Facebook recently with messages like "OMG ... I can't believe this actually works! Now you really can see who viewed your profile!" The app is bogus. I've asked a Facebook representative about this before, and he told me that apps on the site do not have the ability to track who is viewing profiles. In this particular case, clicking on the link provided in the message takes users to a Web page that encourages people to permit an application to access their Facebook profile. "But do you really want complete strangers to be able to e-mail you, access your personal data, and even post messages to any Facebook pages you may administer?" the Sophos post asks. Nearly 60,000 people have fallen for the latest scam, based on figures from Bitly using a search on one of the URLs used in this campaign, according to the post. Facebook representatives did not return e-mails and phone calls seeking comment this morning. Remember to be cautious when adding new applications on Facebook. Try to stick with reputable apps and pay attention to what permissions they seek. If you have been duped by a scam, you should remove references to it from your News Feed, and revoke the right of the app to access your profile via Account, Privacy Settings, Applications, and Web sites.